Discovery Channel — Miracle Planet — Large Asteroid Impact Simulation. DNA molecular biology visualizations – wrapping and replication. The inner life of the cell. RNA interference in action. Low resolution above or available as a high resolution movie. The AI Physician by our Kim Solez. Cryonics Fundamentals by our Edgar W. Swank and Charles Tandy. The End of the World: Are We Doomed? by our David Brin. Existential Risks by our Kim Solez. Mixed and Virtual Reality by our Kim Solez. I am the very model of a Singularitarian by Charlie Kam. TEDx Brussels 2010 – David Orban – Every Thing. A visual trip through the 21st Century. Nanotechnology – Age of Convergence. Visualizes how nanotechnology will be used to repair and upgrade our bodies. Charles Ostman was the “Nanotech Visionary” behind this. Nokia Morph Concept. Morph is a concept demonstrating some of the possibilities nanotechnologies might enable in future communication devices. Morph can sense its environment, is energy harvesting, and self cleaning. Morph is a flexible two-piece device that can adapt its shape to different use modes. Nanotechnology enables us to have adaptive materials yet rigid forms on demand. It is also featured in the MoMA online exhibition “Design and the Elastic Mind”. It has been a collaboration project of the Nokia Research Center and Cambridge Nanoscience Center. Productive Nanosystems: From molecules to superproducts. An 86.1 MB high resolution version is also available. The Dermal display. Special feature with author’s narration. 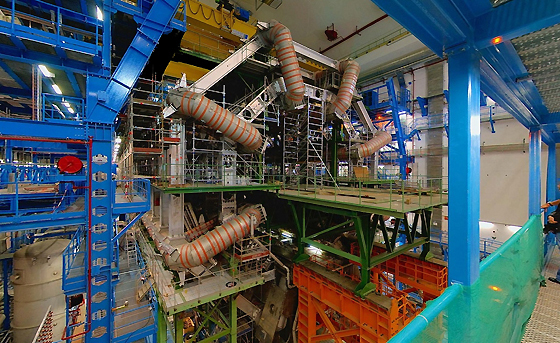 The ATLAS detector of the Large Hadron Collider (LHC) under construction. The LHC is 27 kilometers (16.7 miles) long and spans two countries. Enter 3D panoramas with sound! Large Hadron Rap: Rappin’ about CERN’s Large Hadron Collider! Actroid DER2 fembot released by Japan’s Kokoro. Dancing robots (worth about $4 million in total). High-speed robot hand demonstrates dexterity and skillful manipulation. Blue Beauty: Our Beautiful Earth. An old Star Trek episode comes to life with the Panoptic Systems C-Thru 3D Video Surveillance System, a way for Big Brother to get a “god’s-eye view” of everything going on inside a building or plane. Taking input from numerous 360-degree cameras placed throughout any location, the system combines all those images into one “auto-stereoscopic” display. Watch our new YouTube channel!